The school year is bit more than half over so it’s time for midterms. If you recall, back in August I spent some time plotting out my back-to-school plans for staying sane. It occurred to me the other night as I was [spoiler alert!] packing school lunches, that I may actually be sticking to my resolutions. Go to the head of the class, Marlow! It got me thinking about my overall performance so today I made myself a report card. Use forgotten routine chart – Incomplete. In a recent kitchen cleanup inspired by Apartment Therapy’s January Cure I took down my old routine chart altogether. I had high hopes for that thing but in practice it was never terribly helpful – the kids didn’t consider Mommy-freaks-out-because-we’re-late-again as an occurrence that is of any consequence to them, evidently. I’ve moved on. Stocking the freezer – Needs improvement. I started off strong. I had multiple slow-cooker meals pre-assembled in gallon-sized ziplocs for goodness sake. But now I have a patchy supply of muffins, and actual meals…not so much. It’s not as if I can’t see the upside – after all, scrambling to make dinner at 5:45 after work each night is not so fun. Maybe I just need a study guide: I plan to check out the Cook’s Illustrated Make Ahead cookbook from the library and see if new recipes will motivate me. Night-before tasks – Exceeds Expectations. I was failing at this one until I started attending to my night-before tasks (lunches, coffee maker setup) while preparing or cleaning up from dinner. (For you lunch-packing pros this probably seems obvious, but I used to return to the kitchen to make lunches at 10pm, like a dummy.) It also helps that we’ve gotten into a groove with lunch selections (see below). I now dream of creating some kind of lunch-packing station like I Heart Organizing did here. For extra credit, perhaps. Meal planning – Meets expectations. I’ve been dinner planning as usual but I’m pleased to report that lunch planning has been going fairly well too. 8yo N completes his personalized lunch menu over the weekend (I’ll have to show it to you sometime..) so it hasn’t been such a struggle at packing time. 6yo A couldn’t get into selecting from a menu and she prefers surprises anyway, so now we have a list of her preferred foods and I just throw an assortment into her bento-style lunchbox. So that was my parent-parent conference. Did you have school year resolutions? Do a self-check – there’s still plenty of time to bring up your grades. Now if you’ll excuse me, I have lunches to pack. Posted in motherhood, organizing. Bookmark the permalink. I’ve been going on and on about meal planning lately (see here and here and here), so today, a departure to explore another favorite topic of mine: my to-do list. More specifically, my to-do list app. Because, here’s the thing: it’s not all about the app. Fancy bells and whistles and a sleek interface can’t make up for complacency, forgetfulness or laziness. Furthermore, you need a good system for staying on top of your to-do list – a routine for adding tasks to it, a consistent method for checking it, and a commitment to actually getting the stuff done. And the features and the logic of the app have to click with your personal organizational style, or it’s useless. And so I’ve been really pleased the past few weeks to have found a new app that works for me. I think it’s the one. It gets me, you know? I’d like to introduce you to the object of my app affections. 1. This is a nice looking app. It’s sleek and designy and I love the whole aesthetic of it. It shouldn’t really matter, but it does. I’m more motivated to use something that adds beauty to my day. 2. Like most to-do apps, adding a task is intuitive and quick. Auto-fill options show up for you to speed up your entries but they don’t automatically populate, which would be annoying. It links to your Contacts so if “Call Lauren” is the to-do, you can click right there to call. The voice entry feature is great too – I’ve used it several times. One of the best effectiveness tips is to get in the habit of writing something on your to-do list the moment it comes into your mind. A speedy and streamlined interface is key for this. 3. I like that it guides me to think in terms of “Today”, “Tomorrow”, “Upcoming” or “Someday”. You can also enter a task onto a specific date, of course, but for many of my tasks (e.g., make hair appointment, buy anniversary gift, pay credit card bill) I think more in terms of “am I going to get this done today or tomorrow?” Today tasks that aren’t completed will show up again tomorrow. Upcoming tasks are set automatically for a week from now. You can also organize by folders instead of by timing, for instance one folder for house renovation tasks, one for birthday party plans, etc., but I prefer to organize my thoughts around when I’ll get something done. 4. For any task you can set a pop-up reminder for a particular time. This sounds like a feature that any self-respecting to-do app would have, but alas, the last one I used had no notifications! It was madness, I tell you. 5. The absolute best feature of this app – the feature that, I think, makes it the perfect app for me personally – is its “Any.do Moment”. Once a day, Any.do will prompt you to “take a moment to plan your day.” I have this set for 7am. Anyway, you click on it, and it brings up, one at a time, each task that is in the “Today” category and you are prompted to decide if it stays on today’s list, at which point you can choose to set a reminder pop-up if desired. Or, you can decide, based on a realistic assessment of your day ahead, that you can or should move it to “later”, at which point you’re prompted to decide if it’s something for tomorrow, or in 2 days, or next week. When you’ve gone through all of the items that had been scheduled for “today”, it sounds a congratulatory tone and you see a motivational phrase on the screen, for example, “Like a Boss!” and “Today is the day!” It may sound hokey but I love it! This feature solves the problem that has always plagued me, ever since I gave up paper lists in favor of the touchscreen variety: I forget to look at my lists! I’m soooo organized right up until when I have to actually do something, and then, oops. That was today? The Any.do Moment has helped me close the loop. Posted in organizing. Bookmark the permalink. Last week, I described the method behind my meal planning madness. 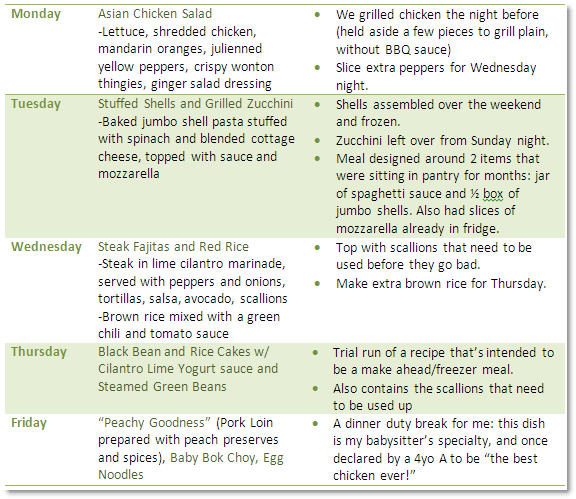 And, here is this week’s menu along with some notes. I could not get links to work in this chart image, so if you want the steak fajita marinade recipe, click here. For the bean and rice cakes, here you go. Enjoy the final days of August, my friends! Posted in mouths to feed, organizing. Bookmark the permalink. As I mentioned last week, my husband and I have a pretty solid routine in place for planning our dinners. People ask me about it sometimes, curious perhaps about how a dietitian feeds her family. So today, a quick description for you and a semi-regular feature I’m calling The Meals Don’t Plan Themselves, where I’ll share my weekly menus from time to time. The short version of the meal planning story is this: visit farmers market on Saturday, develop the menu on Saturday/Sunday, order groceries online on Sunday, groceries arrive on Monday morning, make the meals all week, repeat. Everyone in the family gets the same dinner. It’s hard enough to get one good dinner on the table. I’m sure as heck not making one for kids, one for husband or any such arrangement. Caveat to #1: Nobody wants to fight over Brussels sprouts after a long day of work (i.e., I always plan something kid-friendlier like green beans to serve alongside a “gross” vegetable). Plan with freshness in mind. Vegetables are eaten in the order in which they go bad, e.g.,leafy greens go on Monday or Tuesday, heartier veggies like broccoli, squash, beans can be served up later. Meats can be frozen to be used late in the week if need be. Meatless meals are healthy and cheap-ish and are usually included at least once a week. Use what we have. It sometimes requires creativity and flexibility to incorporate random ingredients and leftovers into the meal plan, but we are fanatical about not wasting food. After the meals are decided, we jot down ingredients that we need to buy, add breakfast and lunch foods and anything else we need to the list, and then I open up the FreshDirect app on my phone and place my grocery order online. Usually this happens in the car on the way to or from a weekend activity. Sometimes I shop from my front porch, wine in hand. Online grocery shopping is a whole other topic for another time, but for purposes of this discussion, I’ll just say that I LOVE IT. I’ve been a weekly online grocery shopper with FreshDirect (a NYC-based independent online grocer) since 2003. That said, most weeks I do still have to run into the grocery store at some point to get something. But picking up two or three things only takes 5 minutes and I almost never have to drag kids with me. The most common reason I hear for not wanting to try online grocery shopping is because people like to choose their own produce. I’ve never had a problem. So yes, I don’t always get to squeeze my own melons (mind out of the gutter!) but I do miss out on the experience of having kids trailing behind the cart whining for junk that I refuse to buy. So there’s that. Though we try to plan for Monday through Friday, sometimes, like this week, we run out of steam and Friday is left blank. We’ll just have leftovers or grab something from a local market that night. And, we rarely plan Saturday and Sunday nights so far in advance, preferring instead to figure those nights out on the fly. Weekend nights are for fun cooking – making elaborate feasts for friends, trying new recipes. Unlike, as you’ll see, the basic (some of them downright mundane) weeknight meals that are easiest to get on the table. We still have almost a month before our kids go back to school here in New York, but already vacations are giving way to back-to-school shopping. Classroom assignments are about to arrive in the mail, sending all of the moms in my small town into a collective tizzy. Talk has turned from beaches and barbecues to things like signing up for Brownies and determining when flag football practices will be. For me, the summer is not so different, routine-wise, from the school year. At least not on the surface. I work full-time and my older kids are in daycamps. There is a morning rush out the door, lunches to pack, after-work dinners to create, workouts to squeeze in. BUT. Getting out of the house by 9 instead of 8 doesn’t really compare. Summer weeknights are devoid of homework and extracurricular activities. On the weekends we’re not rushing to religious school and sports. Even birthday parties happen with less frequency. And all of that is soon coming to an end. Knowing that the daily grind is about to get grindier is a bit unsettling. So, I’ve been handling that stress in my typical way – formulating checklists, making sure I have supplies, making plans, developing a strategy. I’m not in panic mode by any means, but I’ve pinned a silly number of “Easy Weeknight Crockpot Dinners”, let’s just say that. I will resurrect my routine chart – Last year I made a chart to hang in the kitchen to keep us on track in the morning and before bed. I started with a great free printable from one of my favorite blogs, IHeart Organizing. We haven’t even looked at that thing in months. Time to dust it off. I will be disciplined about night-before tasks – I will pack lunches the night before, and I will lay out A’s clothes and hair things, too. This is not rocket science, but for some reason I have never embraced this way of life. I guess I really enjoy spending my mornings yelling at my kids that they’re late as I scramble to throw lunch into a bag and shove it at them (lovingly, of course) as they trip out the door. Yes, that must be it. I will stock my freezer – Recently, we fulfilled a dream and bought a chest freezer. (I know, dream big.) Now I need to get in make-and-freeze mode. I resolve to store up basic daily items like breakfast foods (pancakes, breakfast quesadillas), homemade snacks and treats (chocolate chip cookies, granola), meal builders (shredded chicken for tacos and soups), and full-on meals (chili, chicken sautés, soups, etc). Weekday meal scramble be gone. I will plan more than just dinner – Each weekend JR and I plan our dinners for the week and then I place a grocery order to be delivered by FreshDirect at 6:30am on Monday. We have that routine down pat. But I struggle so much with lunch. Instead of just buying a bunch of lunch-type items and figuring it out on the fly (which never seems to work) I resolve to plan out the lunches for each child at the start of the week. I’ve tried this in the past (in fact, I wrote about it once here) but honestly, I didn’t stick with it. Well, I’m trying again! Heck, maybe if I get good at it, I’ll plan some breakfasts too! How are you getting organized for the school year? Any great tips or recipes? Do share. And, happy back-to-school everyone!